It’s a wily killer who dares to strike on Nero Wolfe’s hallowed turf—and leave a corpse strangled with Wolfe’s own soup-stained tie. But no sooner does the gourmandizing sleuth clean up this first course of murder than he faces a gun-toting wife who serves up a confession of homicidal intent—only to become the sole suspect when the corpus delicti is found. It’s murder à la carte when the third course is served: a cop-hating landlady brings Wolfe counterfeit cash—that leads to genuine murder. It’s up to Wolfe to see that the malefactors get their just deserts. 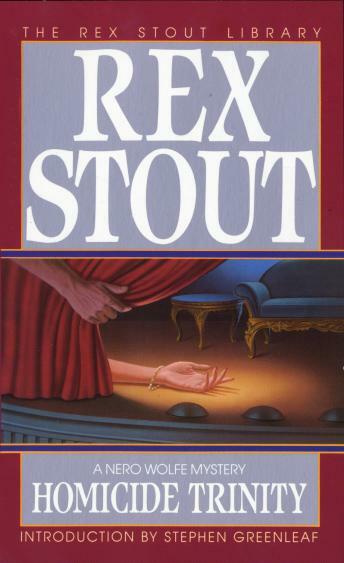 A grand master of the form, Rex Stout is one of America’s greatest mystery writers, and his literary creation Nero Wolfe is one of the greatest fictional detectives of all time. Together, Stout and Wolfe have entertained—and puzzled—millions of mystery fans around the world. Now, with his perambulatory man-about-town, Archie Goodwin, the arrogant, gourmandizing, sedentary sleuth is back in the original seventy-three cases of crime and detection written by the inimitable master himself, Rex Stout.